My mother had a hutch cabinet. It was a base cabinet with drawers and a separate shelf unit on top. Here she displayed varied and sundry dishes. Many people today use this type of cabinet for their teawares. Depending on which pieces you have and how many, you can probably fit them all on the hutch part so they are neatly displayed, not too jumbled or crowded. One thing to be careful about here is not having the pieces touching so one doesn’t scrape another. Another thing is making sure they are securely in place, especially if you are in earthquake country or live near well-used railroad tracks. You might have to consider a glass-doored display cabinet instead. Another option furniture wise is a media shelf unit. We bought a sizeable one for our various music and movie discs (and VHS tapes since it was that long ago) but found that it was better for our collection of teacups and mugs and smaller teapots. Not everyone has a spot in the house or apartment or condo for a large display cabinet or shelf unit. So, some teapots here and a few teacups there are a great idea as long as they are safely perched to avoid hazards such as leaping kitty cats and kids running around, plus those train tracks and earthquakes. Shelves mounted fairly high on the wall come to mind here, but you’ll not have easy access to those teawares. Smaller wall-mounted display shelf units with or without glass doors are another option. 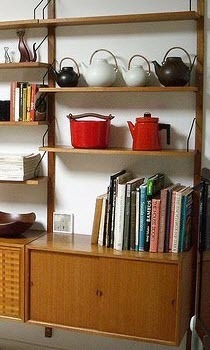 If you have bookcases in your house, you can reserve a shelf or two or even put some books in with those teawares. Asian, English bone china, transferwares, floral patterns, or various color collections (all robin’s egg blue, for example) are just a few options here. The Asian theme could include a tea boat/table, a tea pet, a bamboo plant or maybe a bonsai, your Asian style teapot (cast iron, Yixing, kyusu, etc. ), and even some of your tea implements such as a chasen (whisk for matcha). The English bone china theme can include pictures of British scenes, various icons such as their flag and a statue of Big Ben, along with those teawares. Any subject of interest to you from butterflies to space travel can also serve as a theme here since teapots come in a seemingly endless array of design styles, with more coming daily. Make your home a delight for yourself and others by displaying those wonderful teawares!